Today it begins. With Jesus riding into Jerusalem on a donkey and the crowds laying down their cloaks so that not even his steed’s feet would touch the dirt. Today, they pay him honour. But in a few short days they will turn on him and shout for his crucifixion. This week is a difficult one. The steps that will be taken by Jesus are painful and dark. Th re will be beauty – when he breaks bread and passes the cup – but there will also be so much suffering. He will be hurt in body, mind and spirit before it is finished. Before he is able to win our salvation. Therapy is dark, but it ends in light. The way is painful, but it ends in new life. The way has been long, but we have almost arrived at our destination. 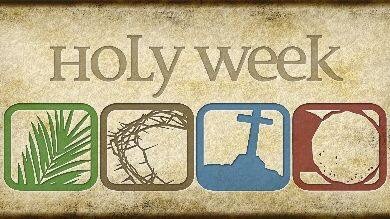 This Holy Week, may you hear the story anew. May you know that Jesus went through it for you. And may you be forever changed by his life, death and resurrection.